Data Realty is the place where data lives. There are plenty of facilities that can simply store your data. But we help bring your data to life by uncovering opportunities. Because we anticipated the need for businesses to better analyze their data, we design our data centers in collaboration with world-renowned data scientists specifically for the analysis of data. We help clients realize a "Return on Data," where a former cost center is transformed into a revenue generator … now that’s living. We believe it is our responsibility to harness the power of data and use it to fuel the economic engine of growing companies, communities and people. MapleNet, Inc. is an innovative and progressive Internet Service Provider serving the greater Northern Indiana area from its base in Goshen, Indiana. Fiber infrastructure is typically exclusive to one vendor. The Metronet is different. Think of it in the context to a highway network. It’s the difference between one trucking company to ship material versus the option of 20 trucking companies − competition matters. Colostore can deliver network services to your Internet customers with unparalleled performance through rock solid systems. We use Cisco and Foundry Networks backed by a full multi-gigabit sonet network. Our network is strategically located in the Midwest which gives equal network performance to East, West and Southern United States and Canada. We utilize several carriers meshed together through BGP (border gateway protocol) and can deliver connectivity to almost every major network backbone in under 5 milliseconds! Our staff is ready to support your colocation and dedicated server services, 24 hours a day, providing you with the highest standards in network services. Our trained professional staff monitors and proactively tests each part of our network, power systems and environmental conditioning, to provide a peace of mind solution to our customers. Please browse through our product offerings and learn how we can help you with your colocation and dedicated server solutions. GramTel South Bend, Indiana Data Center offers an impressive array of flexible and comprehensive data center services to help ensure uninterrupted access to your critical data and applications. The data center is located at 3919 Crescent Circle, South Bend, IN 46628. The GramTel Indiana data center offers a total of 30,000 square feet of space, 14,000 square feet of which is 24 and 36 inches of raised floor white space for colocation services. The expansion facility is also available for custom data halls and office spaces. The data center is SSAE 16 SOC 2 certified and provides excellent security features that include 24×7 on site security guards, and video surveillance and recording of the exterior and interior of the facility. Data center access is allowed through biometric scans, and key cards which are color coded. The colocation services are provided through cabinets, caged space, and private suits. Global Access Point brings computing capacity and high-speed communication together in one place, providing cost-effective, integrated solutions to businesses and universities. With two world-class facilities in South Bend, each connected directly through fiber links to Indianapolis and Chicago, Global Access offers low cost machine space, connectivity, and services in the exact increments and combinations that customers require. Located in a fiber-rich area, Global Access Point's cutting edge technologies help its customers connect to the world and compete in the global marketplace. Has an additional 15,000 square foot data center on the North side of South Bend, IN (where fibers run the toll road). Customers have the option of mirroring or replicating their data between our two South Bend facilities. A scalable, redundant fiber connection between the two data centers. Host Color operates fully redundant and concurrently maintainable IT infrastructure (including all capacity components) which theoretically guarantees 99.995% availability. Based on this one we can guarantee 100% network uptime for service period of 365 days. We use multiple, independent distribution paths to the IT infrastructure. All equipment of ours - Juniper 6350 routers, EX switches, Shared Hosting servers, VPS systems and all Dedicated servers are dual-powered. Host Color uses two separate monitoring systems which work concurrently to provide us and our customers with statistics on uptime of all devices, services and resource usage. The data center rooms feature full concrete hardened structure with 18' to 24' ceilings. Kinetic IT Solutions is also a premier co-location and cloud services provider with the ability to place equipment or services in any major US city. Rack Space: We offer true co-location rack space services in Chicago, Indianapolis, and multiple South Bend facilities. We lease space by the 1U and there are no long term commitments. Off-Site Backup: We can either house your backup hardware or give you space on ours. At the per U or per GB level we can provide backup space for any sized environment. Software As A Service (SAAS): We offer multiple email, phone, backup, and application services that can be hosted in either local or world wide data centers throughout the US. We build custom solutions for each client at very aggressive pricing. 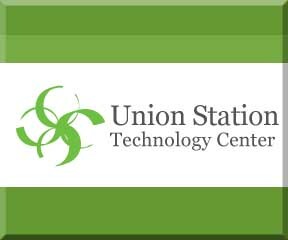 Once a thriving hub connecting people to the world via railcar, Union Station Technology Center (USTC) has been transformed into a state-of-the-art hub for digital information, providing an ideal geographic location for data centers, data transport, and carrier operations. USTC is geographically situated in fiber-rich Northern Indiana and connected directly by fiber optic links to Chicago, St. Louis, and Indianapolis in a complete ringed topology. USTC offers low cost computing space, power and connectivity that enable its customers to connect to the world and compete in the global marketplace. Our infrastructure as a service (IAAS) model serves as the backbone of our operations. As a mixed-use facility, USTC has attracted several national and multi-national corporations seeking to utilize our platform to house their IT infrastructure within our facilities. Our complete turn-key offerings and operational flexibility have allowed USTC to become one of the fastest growing companies in Indiana, the Region’s largest data center, and Indiana’s 2nd largest carrier hotel. Since 1987, USTC has operated as one of Indiana’s premier Carrier Hotels, featuring over 6,000 fiber endpoints. Collectively, over 20 national carriers reside in Union Station with several new carriers building into the facility every year. Our mission at USTC is to serve our clients with the best in breed solutions for space, power, connectivity, and innovation. In addition to its operational capabilities, USTC has focused its design and build philosophy on energy optimization and conservation. USTC is proud of its sustained efforts in innovation and energy leadership over the past 20 years. USTC is 1 of 7 companies comprising KMS Enterprises.